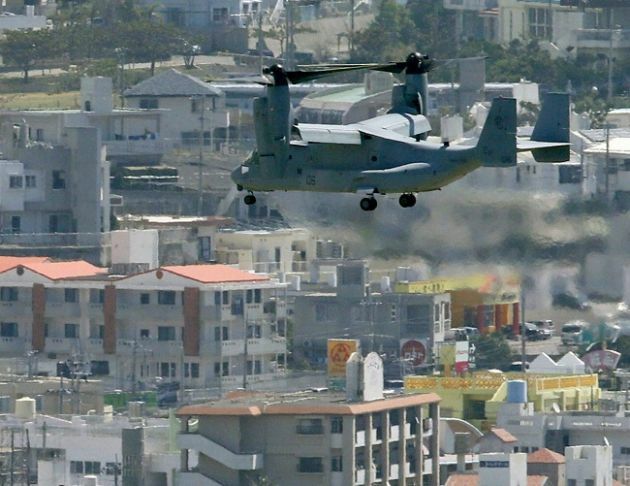 (Photo: Reuters/ Kyodo)An MV-22 Osprey aircraft of the U.S. Marine Corps flies to land at the Marines' Futenma Air Station in Ginowan, Okinawa Prefecture, in this photo taken by Kyodo October 1, 2012. The head of the U.S. Episcopal Church emphasized the role of reconciliation between all parties involved as a key to resolving tensions arising from controversial U.S. bases located in residential areas of Okinawa, Japan. The Rev. Katharine Jefferts Schori made a keynote presentation Monday at the Second Worldwide Anglican Peace Conference in Okinawa entitled "The question of US military bases in Okinawa – The role of Anglican-Episcopal church." She began by putting the specific situation in Okinawa within a larger context. "I want to challenge us all to consider similar situations around the world, and the roles that our respective churches, and the Anglican Communion, might play in reconciliation and peace-making in the face of violence, military force, and war," she began. "It is only together as the Body of Christ that we can hope to find healing, reconciliation, and genuine and lasting peace." Okinawa is the southernmost prefecture of Japan, located on a chain of islands 400 miles (644 kilometers) from the main island of Japan. Numerous U.S. bases were located there after World War II, remaining under U.S. administration until 1972. Schori noted in her address that protests and objections by Okinawans over several decades resulted in a 2006 agreement between the Japan and the U.S. to relocate several of the bases, with plans to move operations involving thousands of U.S. troops to the U.S.-controlled island of Guam more than 1,000 miles southeast. In the most recent talks, the U.S. and Japan said earlier this month they had reached an agreement that the relocation of the controversial Marine Corps Air Station Futenma and the return of military land on Okinawa would take at least another 16 years to complete. The agreement indicates some of the land will be returned starting next year but most of that will require building replacement facilities in other locations and relocation of troops off the island. Plans for approving a relocation will require months to approve. "It seems important to point out that this is an immensely complicated history, with overlapping threads of racism, militarism, colonialism, and fear of the other," Rev. Schori said. "Okinawa has been treated as a colony for centuries. Its residents feel their exclusion and commodification by the larger Japanese public and by the American military." She noted that fear on all sides – including that of Japan, neighboring countries, Okinawans and the United States - needed to be overcome in order for there to be reconciliation. "Until we begin to examine our own participation in those varying kinds of fear, we have little hope for reconciliation," she added. She continued: "Will we, like Jesus, pray for the fellow on the next cross, and the ones who set the cross into the earth?" "We must confront our own fear and move toward the human beings behind the threat, rather than retreat or dig deeper trenches. "That is what it means to run to the empty tomb; that is the direction of more abundant and resurrected life. May resurrection begin again in this place, in the hearts of these blessed people – and in the hearts of those we fear and those who fear us."